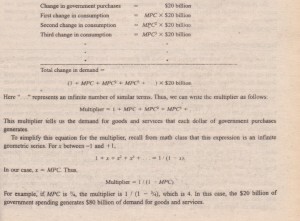 A little high school algebra permits us to derive a formula for the size of the multiplier effect that arises when an increase in government purchases induces increases i~ consumer spending. An important number in this formula is the marginal propensity to consume (MPC)-the fraction of extra income that a house hold consumes rather than saves. For example, suppose that the marginal propensity to consume is 3/4. This means that for every extra dollar that a household earns, the household spends $0.75 el4 of the dollar) and saves $0.25. 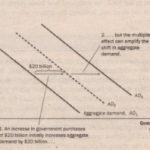 With an MPC of 3/4, when the workers and owners of Boeing earn $20 billion from the government contract, they increase their consumer spending by % X $20 billion, or $15 billion To gauge the impact on aggregate demand of a change in government purchases, we follow the effects step by step. The process begins when the government spends $20 billion, which implies that national income (earnings and profits) also rises by this amount. This increase in income in turn raises consumer spending by MPC X $20 billion, which in turn raises the income for the workers and owners of the firms that produce the consumption goods. This second increase in income again raises consumer spending, this time by MP~ X (MPC X·$20 billion). These feedback effects go on and on. To find the total impact on the demand for goods and services, we add up all these effects. This formula for the multiplier shows an important conclusion: The size of the multiplier depends on the marginal propensity to consume. While an MPC of 3/4 leads to a multiplier of 4, an MPC of leads to a multiplier of only 2. 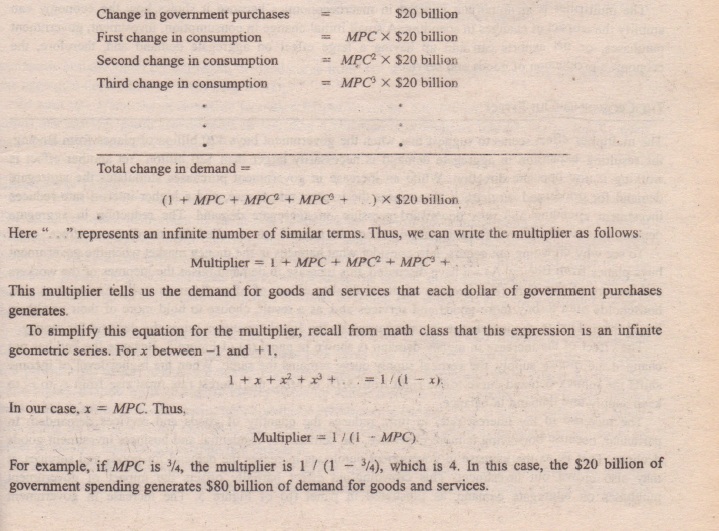 Thus, a larger MPC means a larger multiplier. To see why this is true, remember that the multiplier arises because higher income induces greater spending on consumption. The larger the MPC is, the greater is this induced effect on consumption, and the larger is the multiplier.